Republic Records and Stardog Records unveil the third track from the ROADIES official soundtrack album (“Music From the Showtime Original Series Roadies”)—Lindsey Buckingham’s “Big Love (Live)”. Listen to it exclusively on Apple Music HERE. The legendary guitarist and GRAMMY® Award-winning Rock and Roll Hall of Fame inductee delivers a stunning new rendition of the Fleetwood Mac classic for the soundtrack. In addition, he appears on the Sunday, July 10, 2016 episode of ROADIES to perform “Big Love” and “Bleed to Love Her” on Showtime. The full, 16-song tracklisting for the Roadies Official Soundtrack Album, which will be released August 26th, will be revealed soon. ROADIES airs Sundays at 10 p.m. ET/PT on air, on demand and over the internet. From creator, executive producer, writer and director Cameron Crowe, ROADIES offers a look into the reckless, romantic, funny and often poignant lives of a committed group of roadies who live for music and the de facto family they’ve formed along the way. Luke Wilson, Screen Actors Guild® Award nominee Carla Gugino, Imogen Poots, Rafe Spall, Academy Award® nominee Keisha Castle-Hughes, Peter Cambor, Colson Baker a.k.a. Machine Gun Kelly, and Ron White star in the ensemble cast. Luis Guzman, Jacqueline Byers, Finesse Mitchell, Branscombe Richmond and Tanc Sade guest star. Emmy® and Tony® nominee Winnie Holzman serves as writer and executive producer, along with Emmy® winner J.J. Abrams, Crowe, Len Goldstein and Emmy® winner Bryan Burk. Kathy Lingg is co-executive producer. ROADIES is produced by Bad Robot Productions, Vinyl Films and Dooley & Company Productions, in association with Warner Bros. Television. Stardog Records was created by PolyGram Records in 1989 exclusively an imprint for Seattle glam-rock ​act Mother Love Bone and the group’s releases with subsidiary Mercury Records. The ​label’s ​name is a nod to​ the​ Mother Love Bone​ song​ “Stardog Champion.” In partnership with Republic Records, Stardog Records was revitalized in 2016. Picking up where history left off, Stardog will release a reissue of Mother Love Bone along with the debut release from Reignwolf. A division of Universal Music Group, the world’s leading music company, Republic is home to an all-star roster of multi-platinum, award-winning legends and superstar artists such as Ariana Grande, Black Sabbath, Florence + the Machine, Gotye, James Blake, James Bay, John Mellencamp, Keith Richards, Nickelback, Of Monsters and Men, Seth MacFarlane, The Weeknd, Zendaya, among many others. Founded by brothers and chief executives Monte and Avery Lipman, it is also comprised of innovative business ventures including American Recordings (The Avett Brothers), Brushfire (Jack Johnson), Cash Money (Lil Wayne, Drake, Nicki Minaj), John Varvatos Records (Zac Brown Band), Lava Records (Jessie J, Lorde), Monkeywrench (Pearl Jam), Casablanca Records (Stromae, Tïesto), NBC’s The Voice, School Boy Records (PSY, Sheppard), among others. In addition, Republic maintains a long-standing strategic alliance with country powerhouse Big Machine Label Group which is comprised of Big Machine Records (Taylor Swift, Tim McGraw, Florida Georgia Line) and Dot Records (Maddie + Tae). 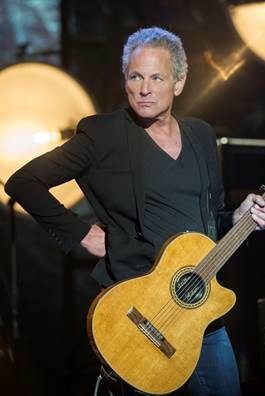 Find the most current Lindsey Buckingham tour dates from our partners at Country Music On Tour, your trusted country concert ticket source! Country Music News Blog participates in advertising programs that help fund the operation of this site. For more information please visit our privacy statement. This entry was posted in Lindsey Buckingham, Press Releases by admin. Bookmark the permalink.